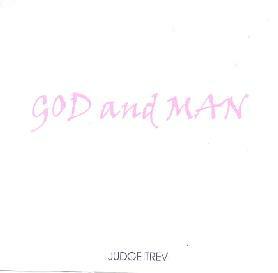 Judge Trev - "God and Man"
Here's something a bit different from Judge Trev. The promo sheet describes it as "Doom/Space/Folk", though it's actually a very personal album of beautifully written and played folk, ballad and love songs. To help him execute his songs, Trev enlists the aid of a few folks you might know: Dino Ferrari, Nik Turner, Harvey Bainbridge, Ron Tree, and Rick Welsh. The album opens with what ended up being one of my favorites. "Beside The Seaside" consists of music and lyrics that have a Celtic pub song feel. And the acoustic guitar work is beautiful!! "Lonely Traveller" is another standout that is part traditional Celtic folk song, and part folk-psych song. It's hard to describe so suffice it to say it's just really solid songwriting. "Battle" starts off like it's going to launch into a metallic assault, but it was the battle efx that got me as this is actually another traditional styled folk song, though there are some brief little freaky synth bits. "Tremblin' Hand" is a ballad, but with nice spacey embellishments from Harvey. Black Raven Love" is a love song with a 60's folk-psych feel, though the trumpet adds light jazzy coloring to the music. And the trumpets on "One Move" have a bit of a Mexican cantina band feel. "The Personality - The Mind", "Yer All Gonna Die" (another one of my favorites) and "God Is Coming" are the more rock oriented songs of the set, though they don't stray too far from the albums musical theme. In summary, God and Man really took me by surprise. Here's a guy who can do Space, Punk and thumping Metal, but is equally adept at writing and playing a good folk, ballad and love song with sensitive and poignant lyrics. Take a chance and check it out. Contact via snail mail c/o Real Festival Music; 34a Upper Lewes Road; Brighton, East Sussex; BN2 3FH; UK.